Filling up with gas energy is nothing special. It’s just as easy as at fossil fuel stations – just a bit different. The nozzle of the gas pump is fitted with a switch. It locks the valve before loading. No more difficult than a door handle. You engage it and during the fill up it may sound and whistle a bit. This is quite normal. Ps. One tip is to first connect the pump and then swipe your card. You have two minutes from when you have selected the pump to press the start button, otherwise you will have to swipe the card again. Remove the blue nozzle from the station. The black lever is turned to the right. 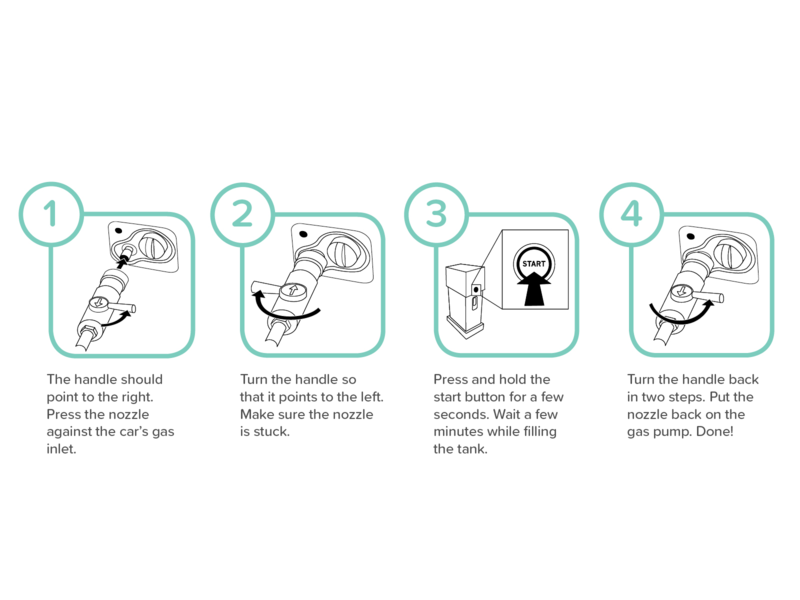 Then press the nozzle against the car’s gas inlet. The black lever should point to the right. You feel a little resistance when pushing the nozzle against the gas inlet, this means you have the right angle. Turn the black lever so that it points to the left. Make sure the nozzle is stuck. Two arrows show that the gas can now flow into the car. Press and hold the start button for about five seconds. Wait a few minutes while filling the tank. The station always stops automatically when the tank is full. Turn the lever to the right. Push back the nozzle of the gas pump, the lever should point straight onto the hose when it is attached to the station. Done! And you – do not forget to disconnect before driving away!